No permits are required. Life jackets are mandatory despite the mellow water (do not become a grim statistic and underestimate the power of even “calm” stretches of this, or any river) and alcohol on the river has recently been outlawed. Authorities have been known to search coolers randomly. Your watercraft could be a….raft, kayak, innertube, waterwings, floating alligator, inflatable kayak, canoe… Please make sure to always wear a coast guard approved personal floatation device! 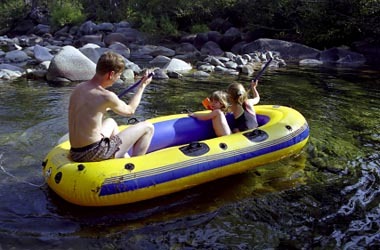 If you don’t have your own raft, kayak, or other floating device, you can rent from either River Rat Raft Rentals or American River Raft Rentals. They also rent life vests, paddles, and have various necessities such as sunscreen and hats. 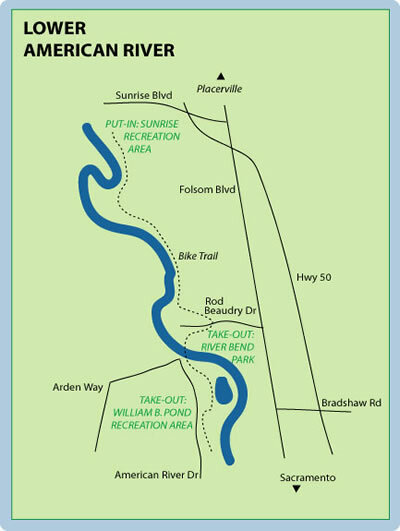 There are no overnight rafting trips on the Lower American River, but if you want to camp locally you have several options like the Beals Point and Pennisula Campgrounds. Rental companies offer shuttles for an additional fee; private boaters will have to arrange their own. Leave a car at River Bend Park or the William B. Pond Rec Area and then drive back to Sunrise for put-in. Since the river is lined by the American River Parkway you can also shuttle by bicycle if you’re fired up for a little bi-athalon action. Those renting rafts and whatnot will be directed to put-in by rental staff. Private boaters put in at the Sunrise Recreation Area. There is a small fee for parking and launching. If you rent equipment the company will give you info about take-out and will also shuttle you back to put-in for an additional fee. Private boaters can take out at River Bend Park. There is a small fee for parking and take-out. If eating on the river doesn’t appeal to you, the park is a great spot to picnic after your day on the water. You can also take out at William B. Pond Recreation Area.